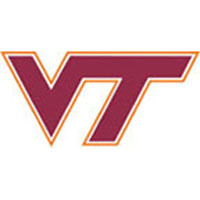 The Virginia Tech Board of Visitors has approved major, wide-ranging facility improvements for the Hokies’ athletics infrastructure. Construction on all phases is expected to begin in the fall. Highlighting the project is a complete reconstruction of the school’s baseball facility, English Field at Union Park. Also included are a new hitting facility for the softball team and major enhancements and additions to Rector Field House, which will not only benefit the track and field programs, but the lacrosse, soccer, and softball teams. Total cost for the improvements will be approximately $36 million and will be paid for by fundraising and debt service. Cannon Design is the architect on the project. Whiting Turner will do the baseball renovations and Branch and Associates will handle the softball and Rector portion of the project. A major gift of $3.5 million from Union Bank & Trust, announced in March, started the fund-raising effort for the baseball facility. The main seating area of English Field at Union Park will be reconstructed and moved closer to home plate. Total capacity is expected to be 1,500, in addition to the left field terrace seating. Plans also provide for a club area to be included in the construction, located behind the first base (visitors) dugout. The new press box tower structure will feature improvements to accommodate fans, the media, and athletics staff. The ground level will include enhanced concessions, marketing and restroom facilities. The second floor will house working press box, ample television and radio broadcast facilities, game operations space, along with four suites. Also part of the construction will be a social area down the right field line that will be available to host functions in conjunction with games. A new video board will replace the current scoreboard in right field to further the enhancements. Another major improvement for baseball will be the construction of a clubhouse in the ground floor of the Jim Weaver Baseball Hitting Facility, past the left field foul pole. The space, currently used for storage, will be redone with a spacious locker room and player lounge, along with a team room, equipment room, and a video room for players and coaches to do individual skills review. There will be several major areas of improvements to Rector, but the largest and most visible will be the construction of an indoor throws area. The addition will feature two throws areas. The addition will be connected to the main arena and will be used for both practice and competition. Also included in this project is an expanded and enhanced entrance on the east side of Rector, including a permanent lobby. In addition, a new outdoor plaza will be constructed on the east side of Rector, enhancing both the field house and Tech Softball Park. A new north wing will be added as well. There will be an expanded training room, along with two halftime rooms that can be used for soccer and lacrosse games, as well as for administrative space for track and other events. The softball hitting facility will be attached to Rector Field House and immediately adjacent to Tech Softball Park. It will provide the Hokies with an indoor infield for practice during inclement weather, along with four cages for hitting and pitching practice. The one-story building also will feature two coaches rooms, an equipment room, a team room, a film room, a mudroom, and team facilities. The facility will be available to the program year-round and will have uses for practice, team events and game-day necessities. The new facility will encompass more than 16,000 square feet. The additions will feature precast heralding, Hokie Stone infill and architectural precast panels, with a look similar to the Hahn Hurst Basketball Practice Center and the Indoor Practice Facility. The enhancements to Rector will add approximately 32,000 square feet to the structure.